To say that found footage films, or shakycam movies, have been hit ormiss in their relatively short history is a bit of an understatement. There have been a few strong entries, but the entire genre has been mostly dismissed as an annoying fad that needs to go away as soon as possible. Suddenly, out of Sundance comes v/h/s, and the rave reviews declared that the genre was legitimate and here was proof positive. 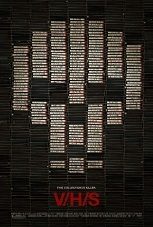 So does v/h/s live up to the hype? Yes and no…unfortunately more no than yes. The anthology is framed around a group of thugs who make a living videotaping them ambushing women and forcibly showing their breasts for “reality” fetish sites. They end up getting a job to break into a house and find a particular tape in that house. They don’t expect what they find and through various circumstances watch the tapes that make up this film. Amateur Night follows three guys on a quest to get laid and videotape it. They make one guy wear a pair of glasses with a camera built in. Frankly, it’s a disgusting short that is offensive and plays to the lowest common denominator. When things take a REALLY bad turn, these guys deserve every single thing that happens to them. Next up, Ti West brings his trademark slow burn to Second Honeymoon. This was the short that played on a segment of the found footage genre that hasn’t been tapped yet, but contained one of the more disappointing endings of the shorts. We’ve all shot home movies. Be it on a camcorder, cell phone or home 8mm camera, there’s something sacred about personal moments in our lives. When someone takes the instrument that was meant to record our lives and memories for posterity and uses it to invade our lives (in this case while we sleep), there’s something incredibly disturbing that left me feeling violated. It made for a very effective build up. Unfortunately, the payoff for the short was a huge disappointment. There are worse endings in the film, but the buildup leading into the ending was so good that it magnified the weak ending. Tuesday the 17th follows the classic story of a group of teens heading up to the woods on vacation only to be slaughtered. The killer actually is shown in a creative way, only coming up as static on the tape. It leaves you guessing if what you’re seeing is natural video noise or the killer. Unfortunately, there was no real setup and the real reason that everyone was brought up there crossed me as idiotic. The Sick Thing That Happened to Emily When She Was Younger is the one short that is most out of place in this film, due simply to the caveat. If you are recording a conversation via Skype, why in the world would it end up on a VHS tape? I did eventually get past that and was treated to an incredibly creepy tale of a young woman being haunted. The only person she can turn to is her boyfriend who lives thousands of miles away. He does his best to comfort her, but there’s only so much you can do from so far away. As with Second Honeymoon, the short has a great premise with compelling characters only to let you down with an ending out of left field that was impossible for me to buy. Finally, Radio Silence ends the film on a real high note in 10/31/98. In what appears to be complete opposition to the morons in Ameteur Night, this is a simple story of a bunch of guys on Halloween looking to have a good time at a party. One of the guys hides a camera in his bear costume, and they go in search of their ultimate party. Of course everyone’s intentions aren’t pure, but these are fleshed out characters who have a real charm to them. When they find what they think is the house and find out that they are SO in the the wrong place at the wrong time, you actually feel for them. The effects work in this segment was outstanding. While definitely standing out, they were in service to the story and definitely amped up the creep factor. This short was definitely the highlight of the film and makes the whole thing worth watching by itself. By the time the thugs’ storyline plays out, you really don’t care anymore as the resolution makes as little sense as most of the shorts, so letting it end before the last short ended up being a brilliant decision that didn’t leave nearly as bad a taste in my mouth. In case you haven’t figured it out, v/h/s is a very uneven film. It’s to be expected, honestly. Even the best anthology films have material that various people will find weaker than others. In my case, I ended up only being happy with one short, but it was a great short. This film is by no means as bad as last year’s Chillerama. The low score is due to the wasted promise the film has. There are themes and subgenres touched upon that show there is still promise when it comes to found footage films, but the execution has to be there from beginning to end. If you do end up seeing it, try to catch it on the big screen as the VOD experience won’t be as intense. I believe the good folks at the Denver Film Society will be showing it soon. Keep an eye out for it there, as that’s the place to see this kind of movie.